We’d love your help. Let us know what’s wrong with this preview of Scholastic Discover More by Clive Gifford. 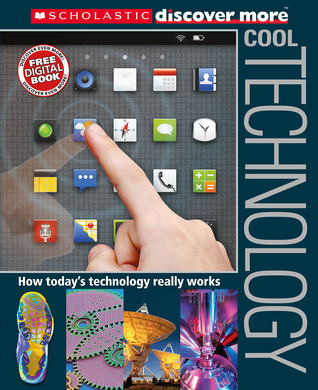 A new-generation reference book about the cool technology of our world, for kids used to surfing and swiping. Our world is full of funky gadgets and technological gizmos. Within the next hour, you will probably use a computer, the internet, a hand-held game, or a cell phone. Technology is not only playing an ever-increasing role in our everyday lives, but also in the way we A new-generation reference book about the cool technology of our world, for kids used to surfing and swiping. To ask other readers questions about Scholastic Discover More, please sign up. How Today's Technology Really Works by Clive Gifford is a informative non-fiction book. This book is all based on today's technology and what is really behind all this great innovative technology. It includes time lines, labels, pictures, diagrams, exploded model of stuff, and facts of things you didn't know, like on page 19 where it shows a cool fact that the Apple MacBook Air has half a million times memory of the Apple 1. That is highly advanced from when the Apple 1 was introduced in 1976. How Today's Technology Really Works by Clive Gifford is a informative non-fiction book. This book is all based on today's technology and what is really behind all this great innovative technology. It includes time lines, labels, pictures, diagrams, exploded model of stuff, and facts of things you didn't know, like on page 19 where it shows a cool fact that the Apple MacBook Air has half a million times memory of the Apple 1. That is highly advanced from when the Apple 1 was introduced in 1976. The Apple MacBook Air was introduced in 2008. That means in 32 years, Apple made a computer that had half a million times the memory of the Apple 1. I learned a lot of things that I didn't know about in this book. I liked this book for 2 reasons. The first reason why I like this book is because it gave a lot of facts and diagrams to make you understand how something works. One example of this is on page 21 where it tells you ho a lithium ion battery works. "Recharging a phone's flat battery causes all its ions (electrically charged lithium ion atoms) to move from the positive terminal to the negative terminal. When the phone is used, the ions flow in the opposite direction, negative to positive. No charge. With all the ions at the positive terminal, the battery is flat and can provide no power. Charging. The ions begin to flow when the phone is plugged into an electricity supply. Fully charged. With all the ions now at the negative terminal, the battery is ready to use again. In use. Electrons power the phone. Lithium ions flow back to the positive terminal." The parts where it has no charge, charging, fully charged, and in use these all were headings on how the lithium ion battery works when its charging or when its dead or when its in use. They come with diagrams of a lithium ion battery to help picture the movement. The second and final reason why I like this book is because it includes every detail of a type of device. One example of this also on page 21 where it shows a blown up view of a smart phone. The blown up view has everything labeled. Some of them are the Capacitive Layer, Sensing Layer, Glass Visual Display, Removable Storage Card, Speaker, SIM Card, Digital Camera, Microprocessor, Image and Video Processor chip, Lithium- ion battery, Lightweight casing, Wi-Fi transmitter and receiver, RAM chip, Microphone, and metal shield. These might not be all the things listed, however, it does has a virtual blown up view of a smart phone. You can see all the parts and components that compose the phone, and also there is a description below the name of the component and it tells you what that component does to make an important role in a smart phone. From these two reasons of why I liked this book, I recommend this book to kids and adults who like to learn about what is really behind the making of the everyday technology that we use both in education and business. This is a book for readers who enjoy the learning about not only about what technology does but also what is making that happen. This review has been hidden because it contains spoilers. To view it, click here. A new-generation reference book about the cool technology of our world, for kids used to surfing and swiping. I learned a lot of things from this brilliant book, I'm interested in Technology and this book made me more interested. The book was exciting, although I got bored reading some of the chapters.. And the book wasn't narrated well.